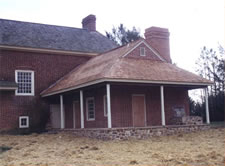 Since its construction in 1738 by Joseph Pennock, Primitive Hall has stood atop its West Marlborough hill, plain but gracious, dignified but friendly, much like the countryside it both represents and complements – a solid reminder of earlier days, and a symbol of the continuity of rural life in Chester County. 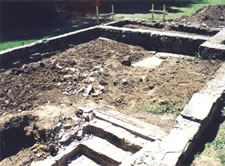 The Board of Trustees of the Primitive Hall Foundation, operating under the Deed of Trust by which the Foundation was established by Stewart Huston, has endeavored over the years to continue the restoration of the Hall, and preserve the property as an important architectural and historic treasure of the region. 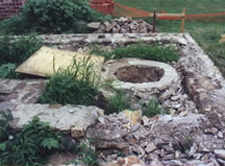 In recent years, the Board has made several important improvements; however, the Board has long recognized that the Hall, was incomplete, lacking any sort of kitchen. 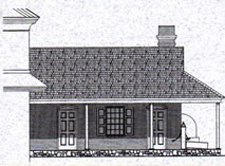 At the time of his death, Stewart Huston was planning the construction of a wing on the north side of the Hall, a wing to house a kitchen with a large fireplace and hearth – features that would allow demonstration of colonial era cooking and baking, thus providing a fuller historical interpretation of the Hall and its era. 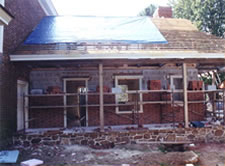 With other projects accomplished, the Trustees went ahead and built the kitchen wing, as Mr. Huston intended, utilizing the architectural concepts he had approved. 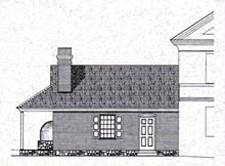 In addition to providing a colonial period kitchen, the wing also has a small, modern kitchen work area, and a much needed lavatory facility. 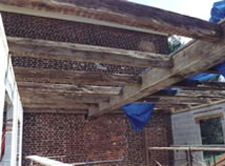 The wing has been designed in a manner to blend with the original structure. The estimated cost of building and equipping the wing was $250,000.00. 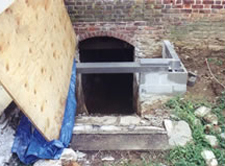 Other physical improvements were contemplated within this program – completion of exterior pointing, waterproofing the basement and landscape planning. An additional goal was the enhancement of endowment, a vital concern, to assure the ongoing operation of the property. With all needs considered, the Board had established a goal of $500,000.00 for this campaign. 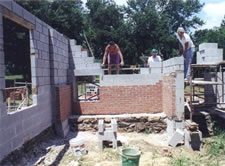 Primitive Hall has been the fortunate beneficiary of much generosity from its many friends and neighbors who have demonstrated their care and concern by their steady support as donors and volunteers. 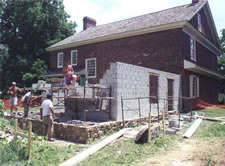 This most recent capital campaign was the largest project the Foundation had ever undertaken, and was the final step required for the completion of the Hall. We are pleased to report that the campaign has been a great success. Your participation in this campaign has allowed us to meet our objectives, and bring Primitive Hall to the fuller, more meaningful use that both it and the community deserve.